Mellmo, which has made a name for itself with mobile business intelligence products, has embraced the iPad in a big way. When Apple started selling its new mobile device on April 3, Mellmo already had updated its Roambi Visualizer app to take advantage of the iPad. On Monday, Mellmo took another iPad-influenced step, unveiling Roambi ES3, a scalable server offering that lets companies convert critical data into interactive reports for iPhone- and iPad-toting employees. Mellmo’s Roambi products first made a splash a year ago, when the company unveiled a mobile app that let users view static data from spreadsheets and tables as interactive charts on Apple’s handheld devices. Along with the iPhone app, Mellmo offers a free online publishing tool for individual users or a secure hosted service for businesses that converts data into those graphs and sends them to an iPhone, iPod touch, or iPad. The Roambi ES3 offering introduced Monday is the latest version of that publishing tool for enterprises. Roambi ES3 connects with new data sources and portals, with IBM Cognos, Microsoft Reporting Services, Microsoft Sharepoint, and LifeRay joining previously supported systems including SAP, BusinessObjects, Salesforce CRM, and Microsoft Excel. “In effect, we’ve doubled the number of systems enterprises can connect to,” Mellmo president Quinton Alsbury told Macworld. Roambi ES3 also extends Roambi dashboards to laptops and desktops by letting users access a Flash version of any file. 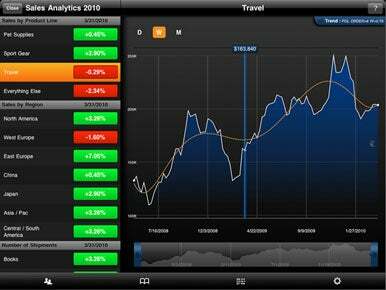 Roambi Visualizer features a new Trends view for the iPad. Roambi ES3 features new views aimed at enterprise users. A trend view shows key performance indicators over time while the new Pods feature lets users combine multiple charts and graphs into a single dashboard. An intelligent skinning scheme lets users add their own logos, images, and colors so that reports match a company’s branding. Other highlights of Roambi ES3 include automated distribution and auto refresh of data. Mellmo also enhanced the security features in Roambi ES3, creating its own version of remote wipe to let administrators delete Roambi content from a device. The revamped offering also lets administrators delete specific files and block specific devices from accessing the server. Roambi ES3 pricing starts at $795 per user for a minimum of 50 users. More pricing information is available from Mellmo. The new Trends view, for example, uses pre-set algorithms to identify data trends. Users can compare data across a variety of time periods, and even use a slider at the bottom of the graphic to zero in on a specific period. Touching two points in a Trends graph makes the app calculate the difference between those points. The existing PieView, CataList, and SuperLists have also been rejiggered for the iPad. The release of Roambi ES3 wasn’t the only enterprise-centric news announced by Mellmo Monday. The company also said that it’s now an SAP-endorsed business partner, meaning its offerings officially complement SAP’s own software. Alsbury contrasts this latest development with a year ago, when people were warning Mellmo that the iPhone wouldn’t be much of an enterprise tool. "We proved that to be emphatically untrue,” said Alsbury, noting that company has sold 50,000 licenses, including many to Fortune 500 companies.